The start of the Stamford Striders 30k race with eventual winner Aaron Scott (685) at the front. Stamford flyer Aaron Scott continued his dominance of the local long distance running scene when winning the Stamford Valentines 30k for the third successive year. The Notts AC athlete finished in a time of 1:40.12, breaking a sequence which saw him run a course record 1:37.52 in both the 2014 and 2015 races. The England international didn’t have it all his own way on the windy, undulating course though. 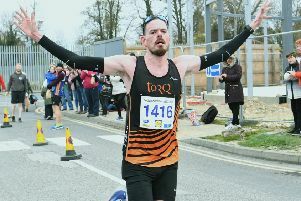 It was only in the closing stages that he pulled clear of former Werrington Jogger Anthony Johnson, now running for Kent AC, to finally gain a one-minute advantage. Despite being ranked 16th in the country over the marathon distance in 2015, the 28 year-old is unlikely to be allowed to race the Virgin London Marathon this year, having missed the entry deadline. He may run the Rotterdam Marathon instead. Matt Alcock of Hermitage Harriers was third, some seven minutes behind Scott, while PACTRAC’s Paul Lunn, a partner of both Scott and Johnson in the ‘Helpston Harriers’ training group, finished fourth and first veteran, trailing Alcock by over two minutes. Bedford AC’s 51 year-old veteran, Gill Fullen, followed up her victory in last month’s Folksworth 15 finishing first lady in 1:58.12, easily beating the Over 50 course record. Halifax Harrier Sarah Louise Cumber was rewarded for her long journey from West Yorkshire taking second place, with Kirstie Meeten of Bedford Harriers third lady over the line. Maggie Skinner from host club Stamford Striders ran well taking fourth place with a time of 2:05.03. Several Peterborough-based athletes were to the fore. Danny Snipe led the Peterborough AC contingent home with an 11th place finish and his clubmate Steven Hall was a further 11 places back. Castor-based Mark Beard has been an unsung hero of the local running scene for over 20 years, often passing under the radar as he chooses to run as an unattached athlete. The 47 year-old had a fine race finishing 17th in 1:57.31. Mike Chapman was the first Nene Valley Harrier home, just dipping under the two-hour mark and finishing 24th. Chapman was using the run as part of his London Marathon training regime. The 36 year-old fitness instructor is confident of running sub 2:40 in London. Yolanda Gratton, wife of former London Marathon winner Mike, was another Harrier to impress finishing as second female Over 40 with a solid 2:15.51 clocking in her first outing of the year.